With the holidays coming up, here is a great home-made gift idea. With 3 ingredients, this is probably the easiest dessert recipe ever. Play with the variations of toppings of mix-ins- dried cranberries or cherries would add a different texture to the chocolate and complement it nicely. This treat is a good excuse to indulge during the holiday season, isn’t chocolate suppose to be good for you anyways? 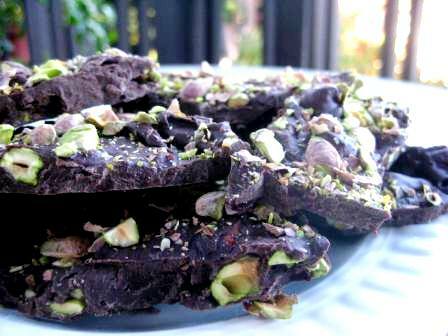 Specks of green pistachios in this chocolate confection make this a festive holiday gift. Line the bottom and sides of a baking sheet with foil. Melt 24 ounces chocolate in a double boiler over hot water. Stir often with a rubber spatula so it melts evenly. Whisk in 1 tablespoon of orange juice in the end when you take it off the stove. Add the pistachios to the chocolate; stir to mix well. Working quickly, scrape the chocolate onto the prepared pan, spreading it to an even 1/4-inch thickness with a rubber spatula. 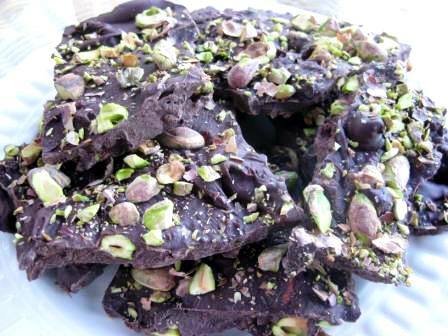 Sprinkle the remaining pistachio mixture on top; gently press it into the chocolate with your fingertips. Refrigerate, uncovered, just until set, about 20 minutes.